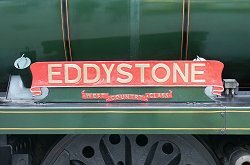 A summer miscellany on the Swanage Railway - summer weather was scarce in late July but the railway provided an intensive service for the Swanage Carnival weekend including late night running until midnight! Motive power over the weekend was provided by 813, 6412, Crompton 33 108 and the DMU. With Corfe Castle in the background, No. 813 enters the down loop at Corfe Castle. No. 813 waits for departure from Swanage with a late afternoon up service for Norden.